Follow the visual journey of photographer Caroline Pang as she delves into the captivating Buddhist practices, rituals and festivals in Bhutan. 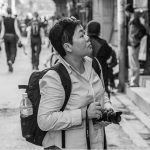 I travel across Asia to document the connection between people, culture, nature and the environment for assignments and for personal projects. Bhutan is the latest destination added to the project. One particular subject that interests me is Buddhism teachings and practices in the Himalayan countries and Southeast Asia. I have witnessed Buddhism practices in many different forms, from Myanmar to Bhutan. In these predominantly Buddhist countries, there are some similarities in terms of spiritual dances, music instruments and the Buddha figures, yet some rituals and ceremony differ. Certain discoveries are startling yet interesting. 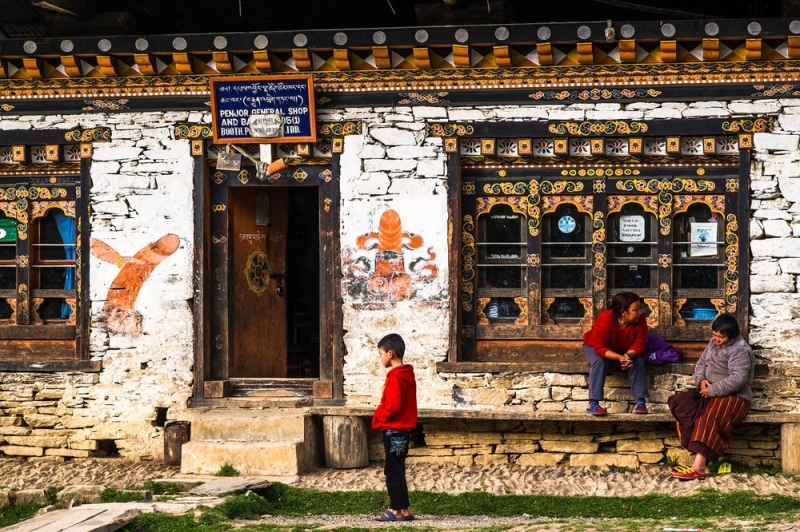 It was Bumthang where Buddhism was first introduced in the 8th century by an Indian Tantric master, Guru Rinpoche. It is also known as Tantric Buddhism which originated from Tibetan Buddhism. 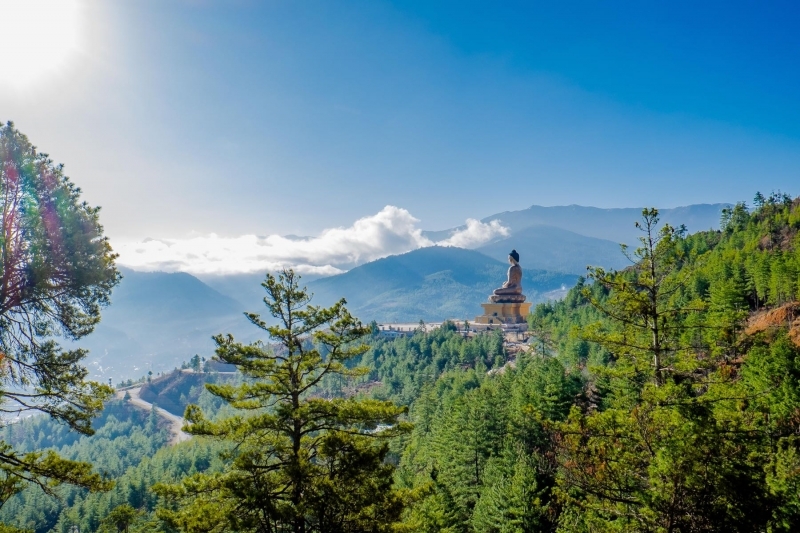 Ancient temples and monasteries with many religious relics and histories are found in Bumthang, central Bhutan. Phallus wards off evils and brings good luck. It is not unusual to see phallus painted on walls and featured at religious festivals all over Bhutan. It is one of the Tantric Buddhism beliefs that phallus wards off evils and brings good luck. This was introduced by Drukpa Kunley, also known as the Divine Madman, a legendary Buddhist monk of the 15th century who teaches Buddhism in an unconventional way using outrageous sexual humour. The phallus remains as one of the religious symbols until the present days. 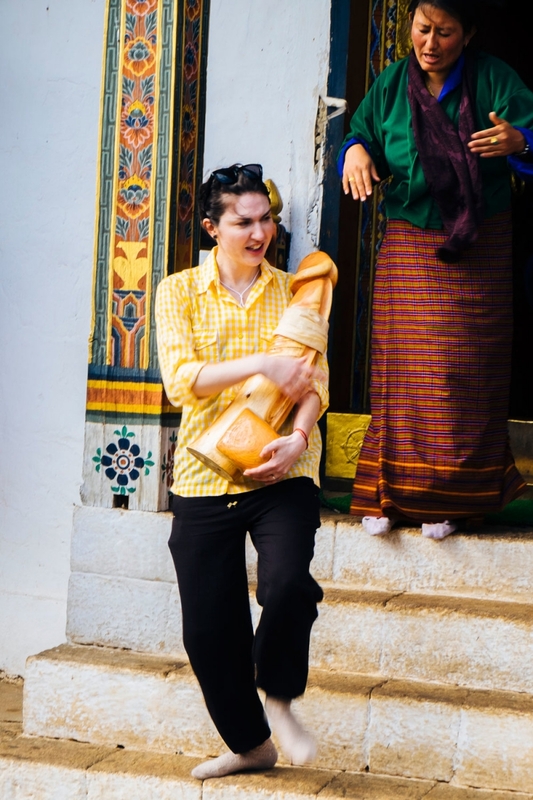 At Chemi Lhakhang, it is common to see a woman carrying a phallus and walking clockwise around the temple. This is part of the ritual for women and couple who come to this temple to pray for a child. Chemi Lhakhang is located in the valley of the Punakha farmland. 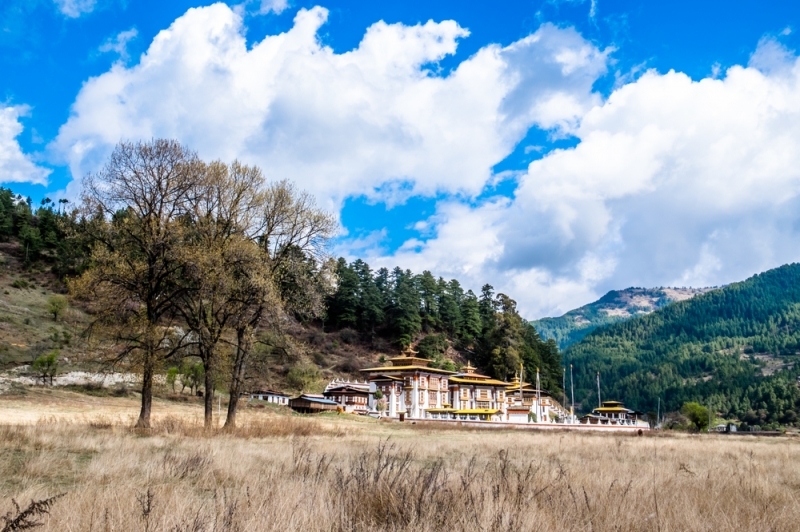 Also known as the Fertility Temple, it was built by Lama Nawang Chogyel in 1499. 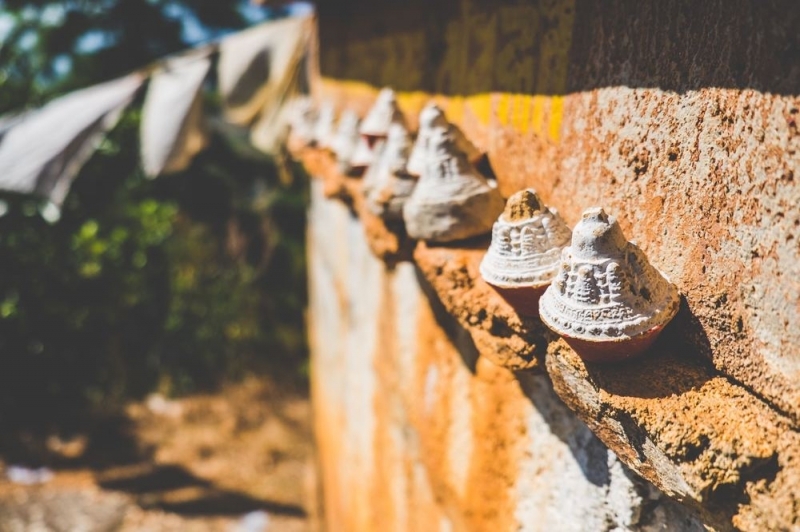 Besides being painted on walls, phalluses are hanged at the corners of homes for protection. Small cones like these can be seen between cliffs, temples and under prayer wheels. These are the remains of human ashes placed by relatives of the deceased, hoping to liberate their souls. 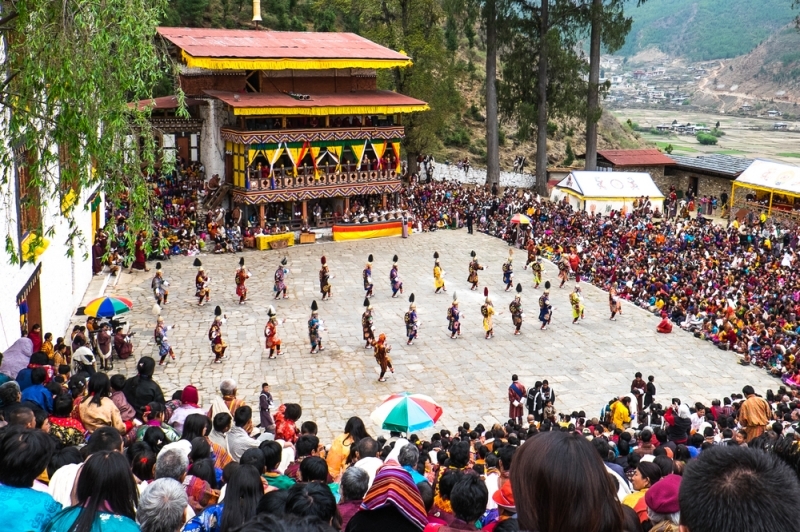 Religious or Cham festivals, also known as tsechu, are held annually across Bhutan in the dzong (fortress) which houses Buddhist monasteries. The festivals are very colourful, with a combination of fast moving and meditative dance movements. The sequel to Mask or Cham Dances is composed by deities of the Tantric Buddhism including Guru Rinpoche, also known as Padmasambhava. Deities are invoked during the dances to give blessings and to ward off evil spirits. The dances are performed with continuos whirling in a meditative state of mind, some with a knife in the dancer’s hand. Such intense dance movement is to purify the space and to invite the blessing of the divinities. These are sacred dances which are not considered entertainment even though they are opened to the public. 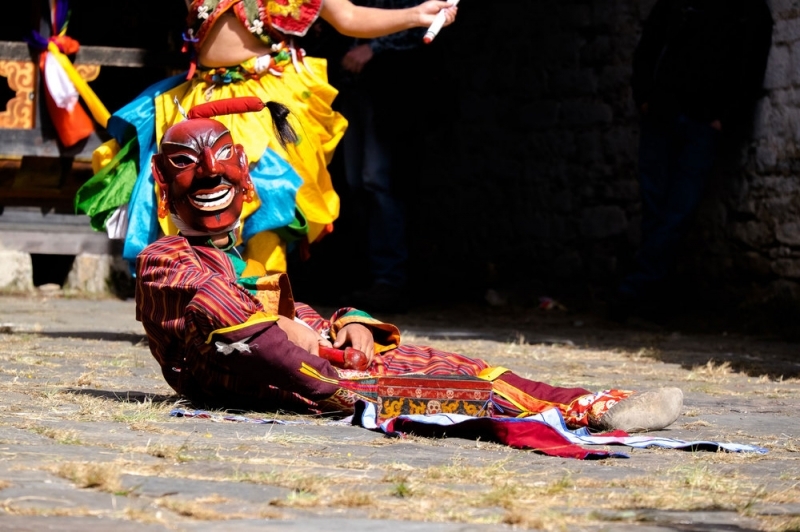 The atsaras (clowns), which are mostly monks in disguise, are a hit among spectators in all religious festivals. They mock the audience and the dancers. They would go around with a phallus to bless the spectators with some humour. The gesture is to ward off evils and bring good luck. The atsara can be quite abrupt with their act, simply to make people feel embarrassed. Embarrassment is also a blessing, as I was told. The embarrassment helps to cleanse any unwanted or evil thoughts that come into mind. Among all the Cham dances documented in my journey, the most unusual one was the Naked Dance. 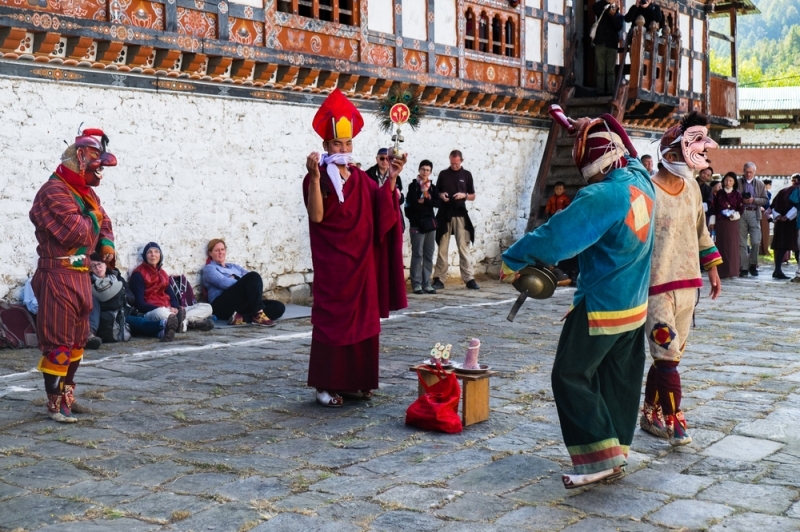 This dance was performed at Jambay Lhakhang in the freezing winter midnight by a group of naked men with mask-covered faces. They paraded around the bonfire, dancing and chanting to wade off the evil spirits. 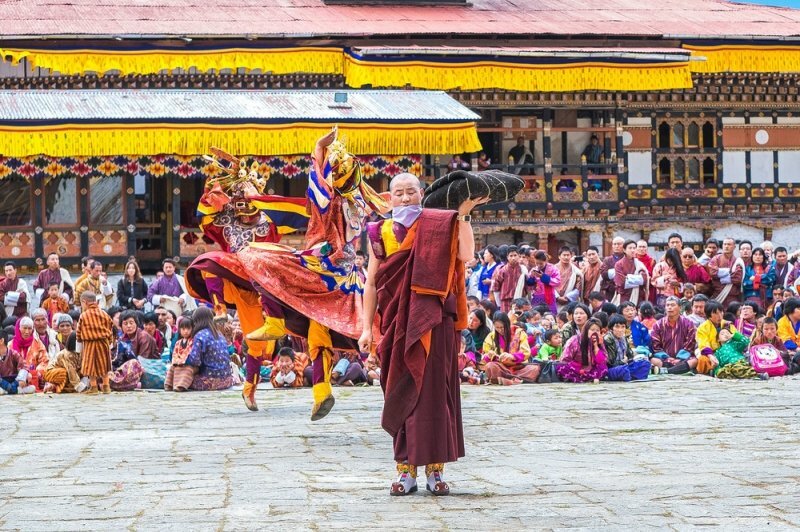 This sacred dance has been performed for many centuries to commemorate the construction of Jambay Lhakhang and to honour Guru Rinpoche, the patron saint of Bhutan. 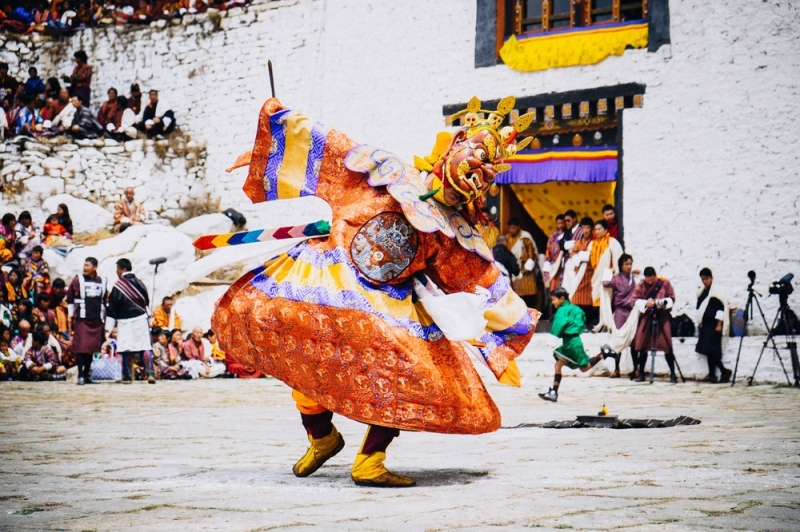 How this dance came about was that in the early centuries, the construction of Jambay Lhakhang was hindered by many demons. Monks have performed many rituals to wade off these evil spirits and all were unsuccessful. The head monk came up with an idea for his final ritual: he called upon all men to be fully naked, with only their faces to be covered with masks. His intention was to make the men look unusual and foreign to the demons. The act and disguise startled the demons, and the evil spirits started to vanish one by one from the temple grounds, allowing the construction of the temple without further obstructions. The ritual is opened to the public and no camera is allowed to document the ritual. Caroline Pang is a travel photographer based in Singapore. Her photography interests are people, culture and the environment. She travels across Asia to document such existence. Bhutan is her latest destination. Her work can be viewed at her website and she updates her travels and discoveries periodically on her Facebook page. 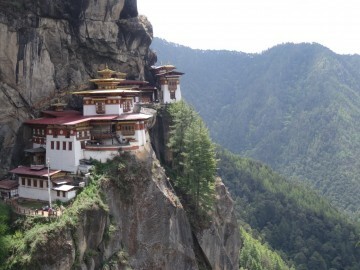 Here's how it's like to hike up Bhutan's most sacred site.